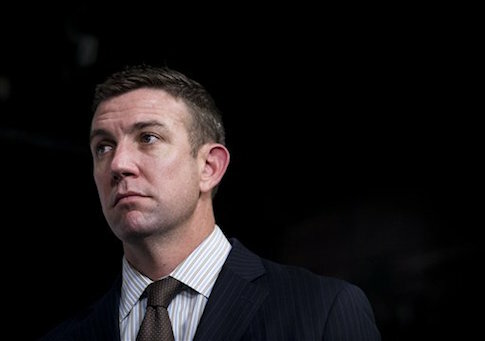 The Congressional Black Caucus held an event on Tuesday to rehang a painting that depicts police officers as pigs, which Rep. Duncan Hunter (R., Calif.) removed last week from a tunnel that connects the Capitol with a House office building. Duncan's chief of staff, Joe Kasper, said Friday that the painting was inappropriate after the congressman took it down. The artwork was created by a high school student and shows pigs wearing police uniforms pointing guns at black citizens. The student who created the painting is from St. Louis in the district of Democratic Rep. William Lacy Clay (Mo. ), who put up the painting in June after it won a local art competition and fought to rehang it this week, according to the Washington Examiner. Clay said that he intends to file a complaint against Hunter with the Capitol Police. "The rehanging of this painting for public view represents more than just protecting the rights of a student artist," Clay's office said in a statement. "It is a proud statement in defense of the 1st Amendment to the U.S. Constitution, which guarantees freedom of expression to every American." However, after Clay and other lawmakers in the Congressional Black Caucus held an event on Tuesday to rehang the controversial painting, it was taken back down. Hunter said he was not the one who did it. It turns out that Rep. Doug Lamborn (R., Colo.) was responsible for removing the art piece and took it back to Clay's office. Clay then went back to rehang the painting again, according to social media reports. Shortly afterward, Republican Reps. Dana Rohrabacher (Calif.) and Brian Babin (Texas) returned to where the painting was hung and took it down. They promptly returned it back to Clay's office once again. The congressmen explained that they took the painting down. The argument was made to them that if someone wants to hang the art piece in a private gallery, then they have the right to do so because of freedom of speech. "But you don't put something attacking policemen, treating them like pigs, here in the Capitol," Rohrabacher responded. Clay then walked the painting back to the wall from which it was taken down, calling efforts to remove it "childish." UPDATE 6:52 PM: This post was updated to include further developments in the story after Rep. Clay first returned the painting on Tuesday. This entry was posted in Issues and tagged Congress, Duncan Hunter, Police. Bookmark the permalink.